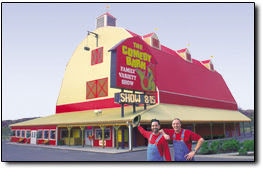 Have you ever been to The Comedy Barn in Pigeon Forge, Tennessee? McQuearyClan has been there twice and recommend it highly. The Comedy Barn offers clean comedy for an enjoyable evening of family fun. You'll laugh until you can't laugh anymore. Logan found a clip of one of the skits where people in the audience are brought up on stage to participate. It's about 9 minutes long and I laugh every time I watch it. or on his Blogan Logan link to the right. Thanks for looking. You Go Jon, You YOUTUBE Groupie! Yes, Randy and I have been to the Comedy Barn. This is crazy...when we went, they called the minister of Harrison Church of Christ up on stage to do a skit with them. It was hilarious. That was a long time ago, but I still laugh everytime I think of it.